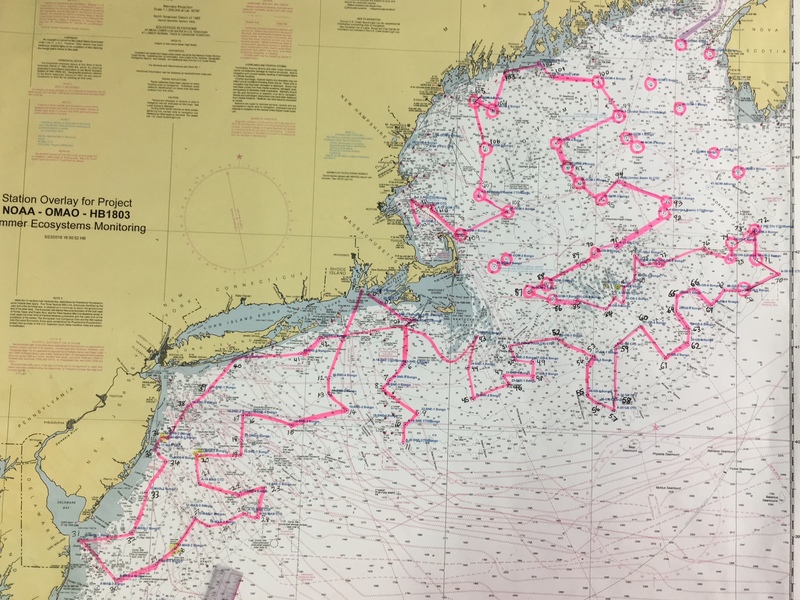 After completing a southern route past Long Island, New Jersey and Delaware, the Henry B. Bigelow headed north to the Gulf of Maine (GOM). The first sampling stations in GOM were located on the continental shelf close to the slope. 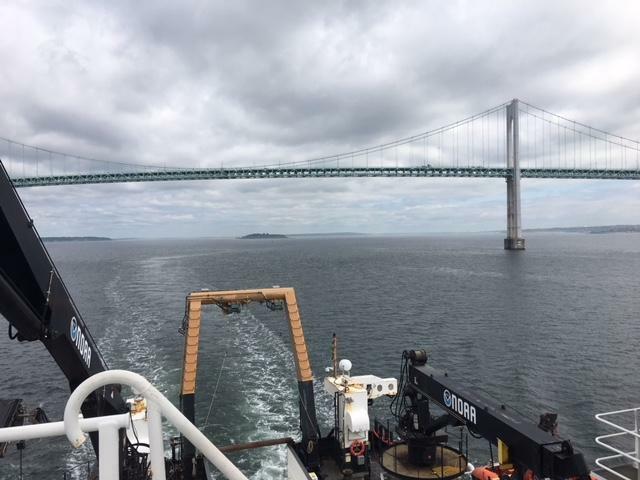 After sampling in the Northeast Channel of the GOM, stations will be dispersed throughout the Gulf of Maine. 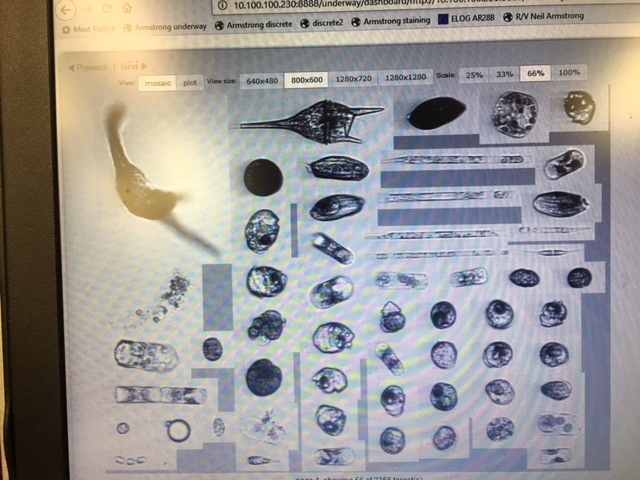 Phytoplankton is continuously imaged through the Imaging Flow Cyto Bot and collection is going well. 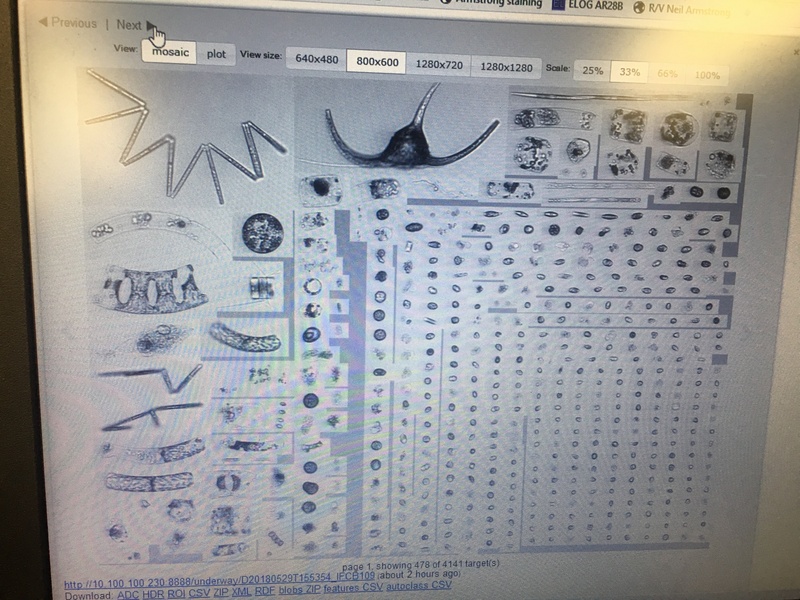 Below is a recent image taken. Can you find Thallasonemia or Ceratium? 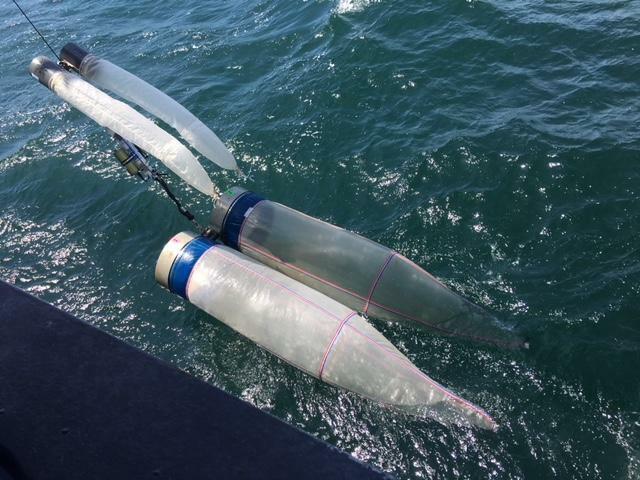 At various stations instead of towing bongo nets with a CTD attached, a CTD, Rosette, is deployed with niskin bottles. 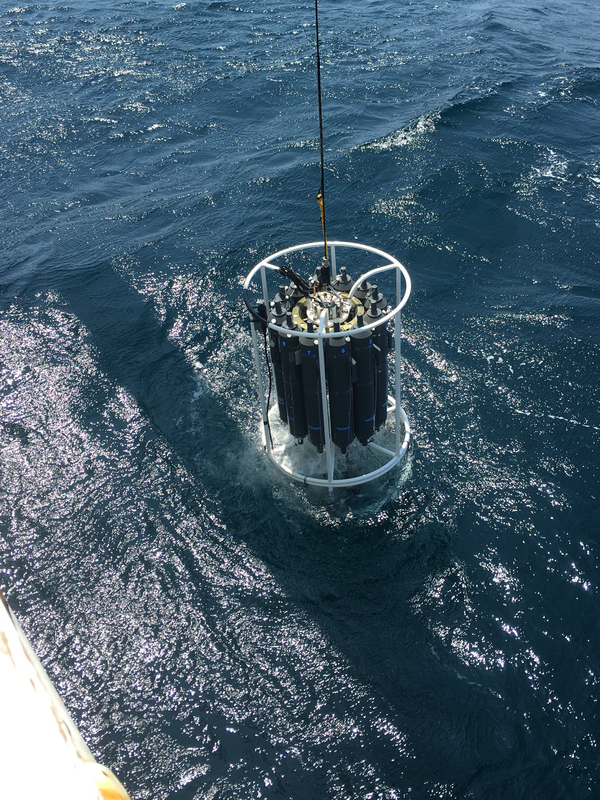 CTD contain sensors that measure Conductivity (salinity), Temperature and Depth. 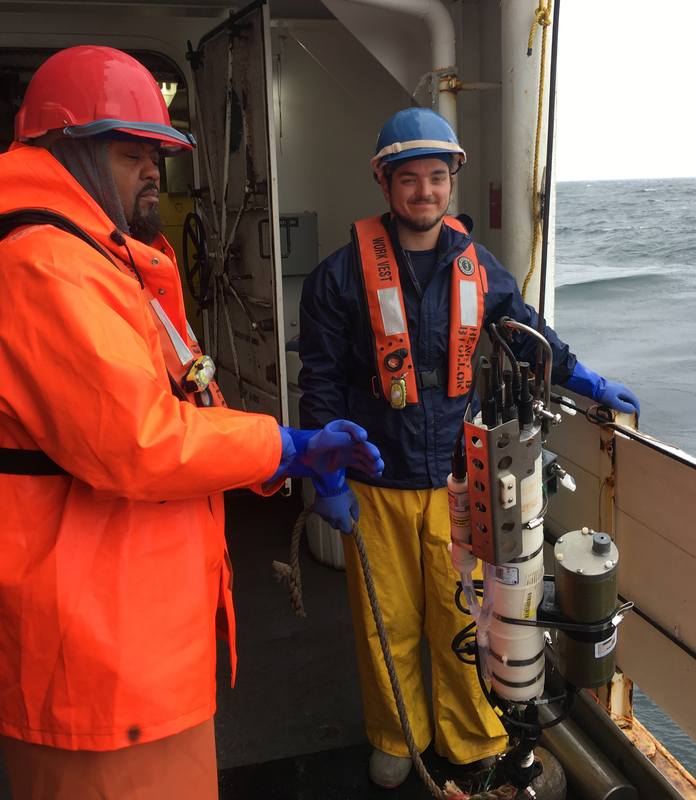 The data gathered provides profiles of chemical and physical parameters of the ocean. CTD on bottom of instrument with 12 Niskin bottles forming a rosette. 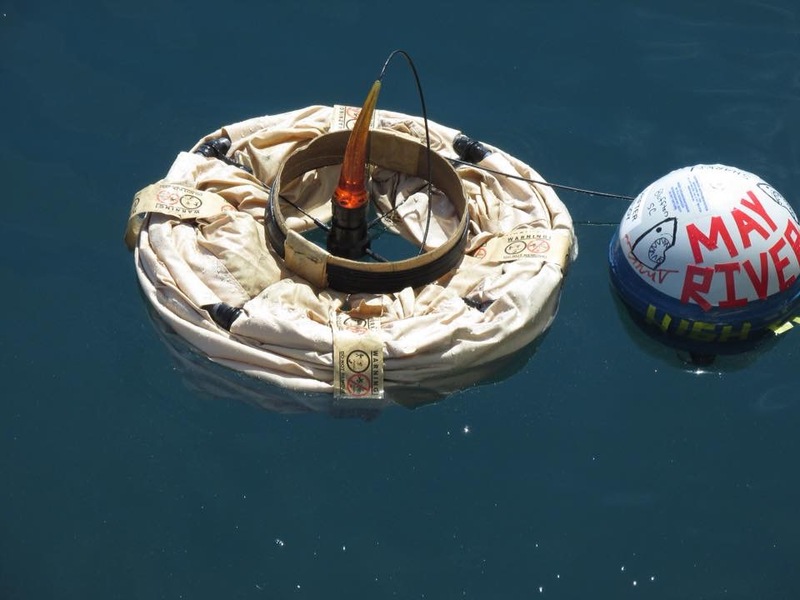 The great feature of the rosette is its ability to collect water using Niskin bottles as hydrographic instruments. 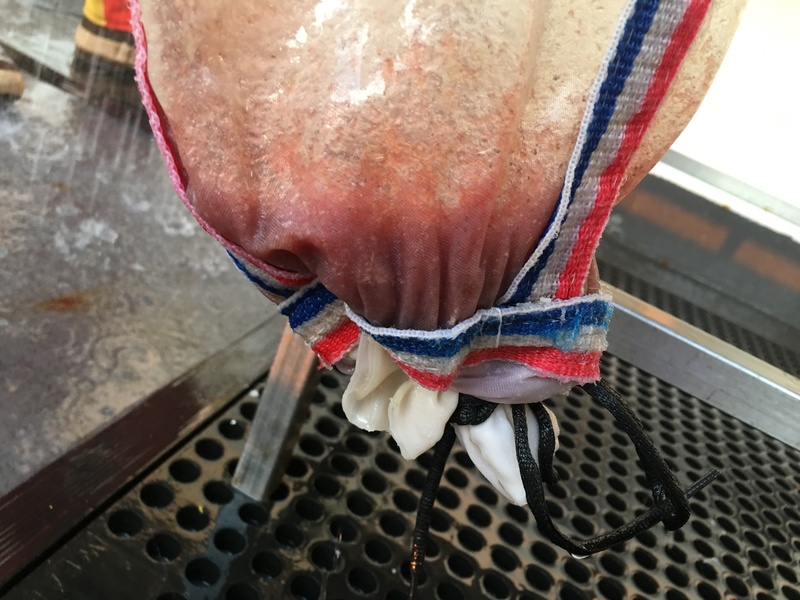 Opened bottles are lowered into the ocean and at the desired depth a bottle is closed and brought to the surface without mixing with other water so pure samples can be taken at different depths. 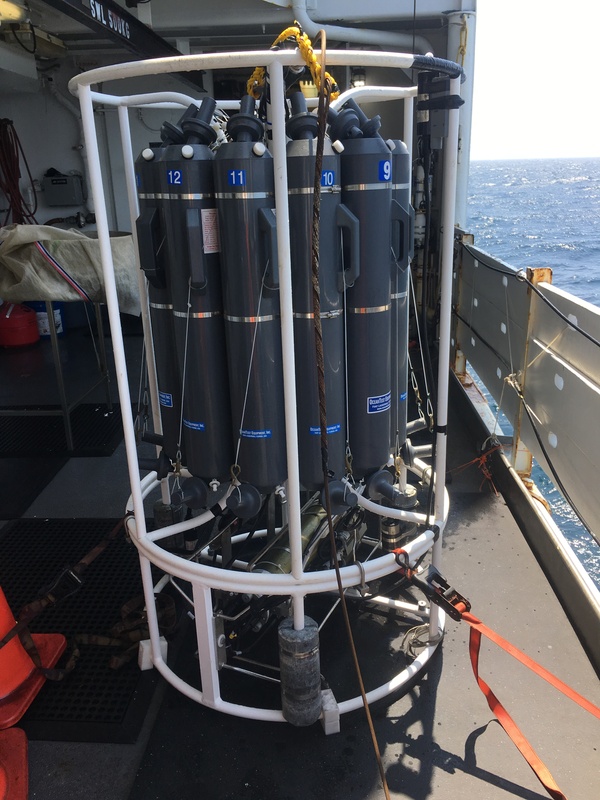 Back on board, water is taken from the Niskin bottles and nutrient, chlorophyll and carbon dioxide tests are run on the samples. 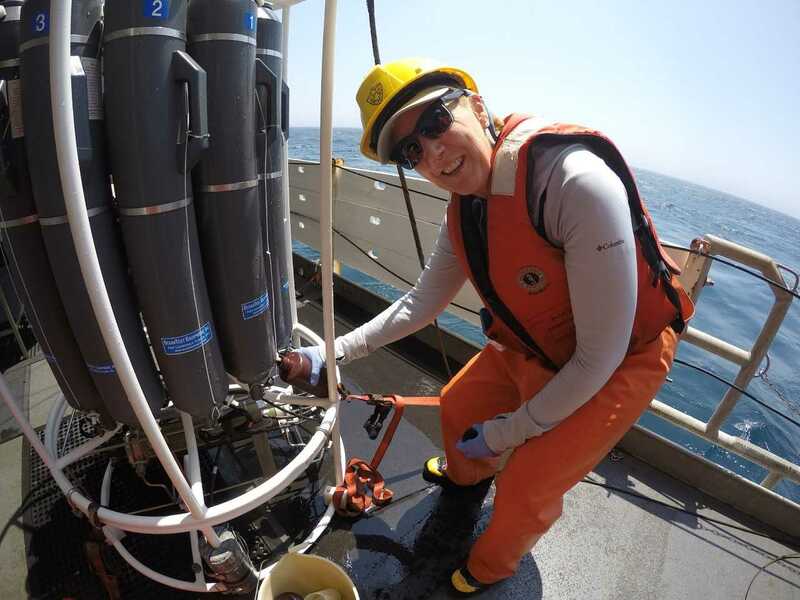 Susan taking water samples from niskin bottles to perform chlorophyll tests at 3 different depths. Georges Bank is in the southern part of the Gulf of Maine. The bank separates the Gulf of Maine from the Atlantic Ocean. It is a huge shoal that is 100 meters higher than the surrounding ocean floor and is a very productive area of the continental shelf. 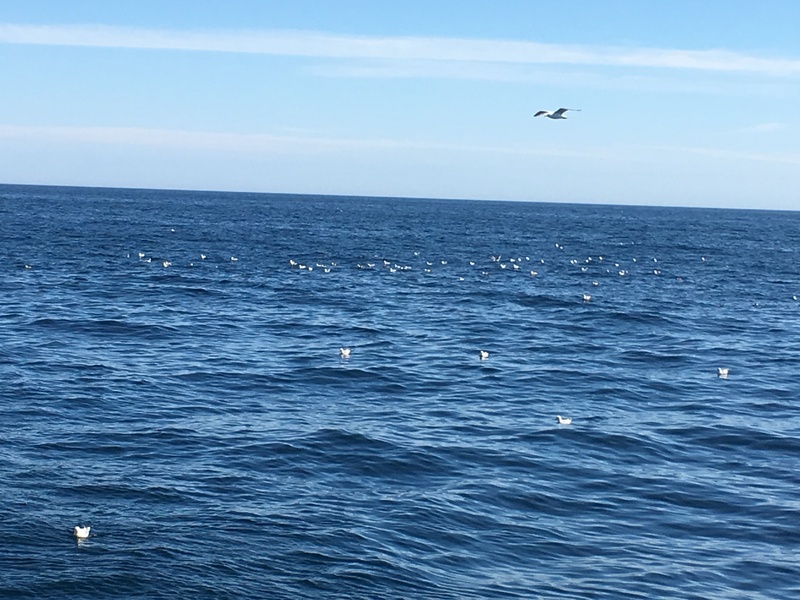 The mingling of the Labrador current from the north and the Gulf stream on the eastern edge plus sunlight in shallow waters, creates an ideal environment for phytoplankton and zooplankton. Once a bountiful fishery, it is presently recovering from over fishing. 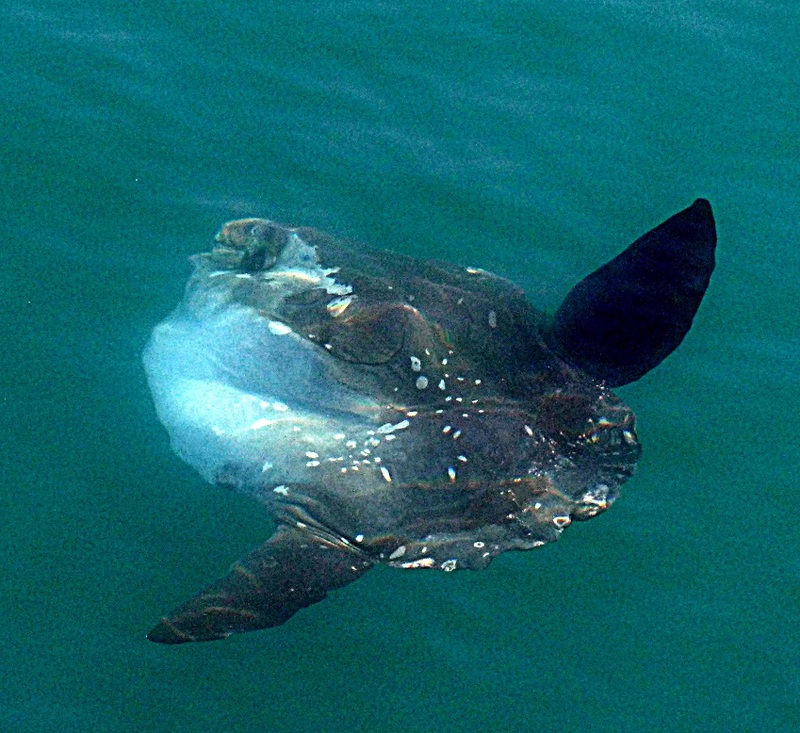 Federal Fishery regulations aim to ensure recovery of the area and future sustainability. The data samples collected will give a good idea of the recovery of this area. 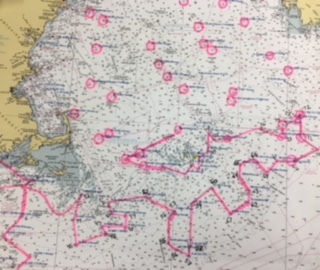 The pink line below shows the route taken by our ship in the southern Gulf of Maine and Georges Bank. 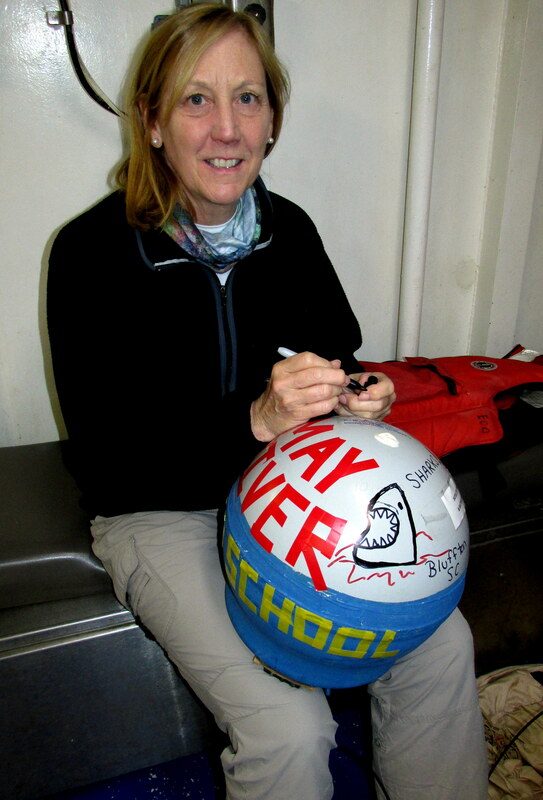 When we were near the Northeast Channel in the Gulf of Maine, Latitude 41° 53.2′ N and Longitude 65°47.0′ W, I deployed a satellite-tracked Drifter Buoy decorated with our school name May River Sharks. 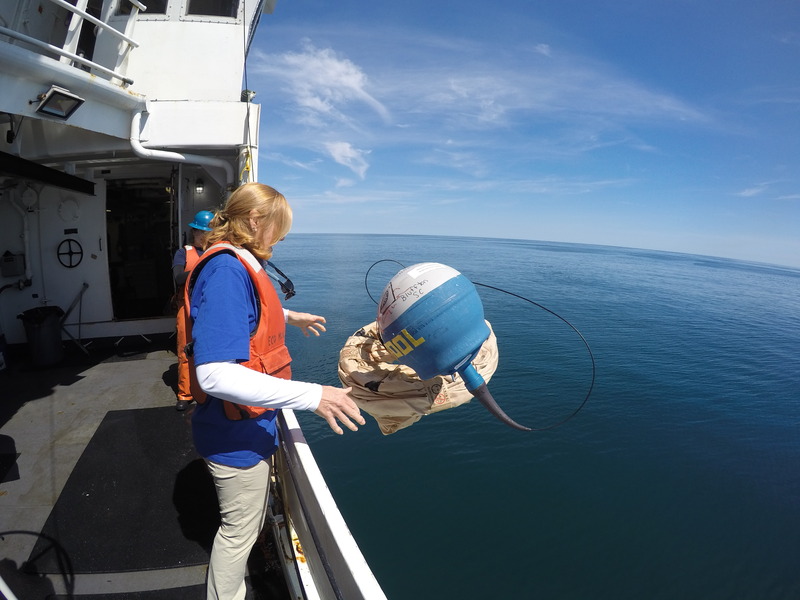 The drifter buoy will send GPS and temperature data to a NOAA website and students will be able to track its path. 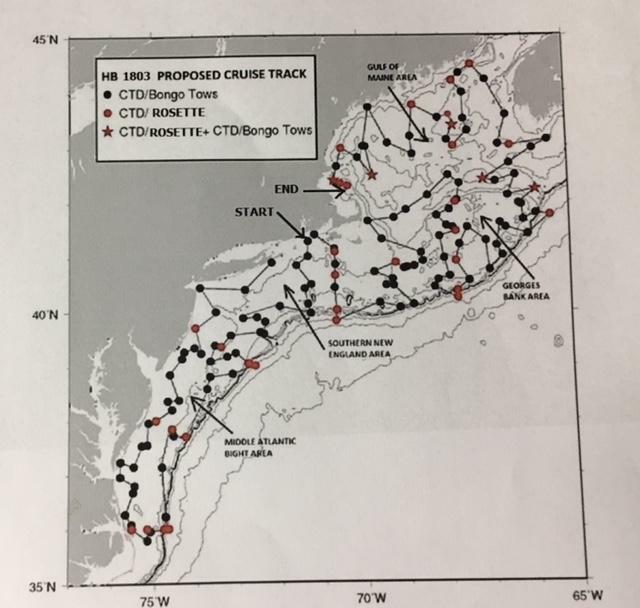 This area was chosen to deploy because the Labrador current from the north meets with the Gulf Stream and hopefully the buoy will get caught up in one of the currents. It will be fun for students to track the buoy path in the fall. Wonder where it will go??? Oh where, oh where, will you go? So far this trip the weather has been great. 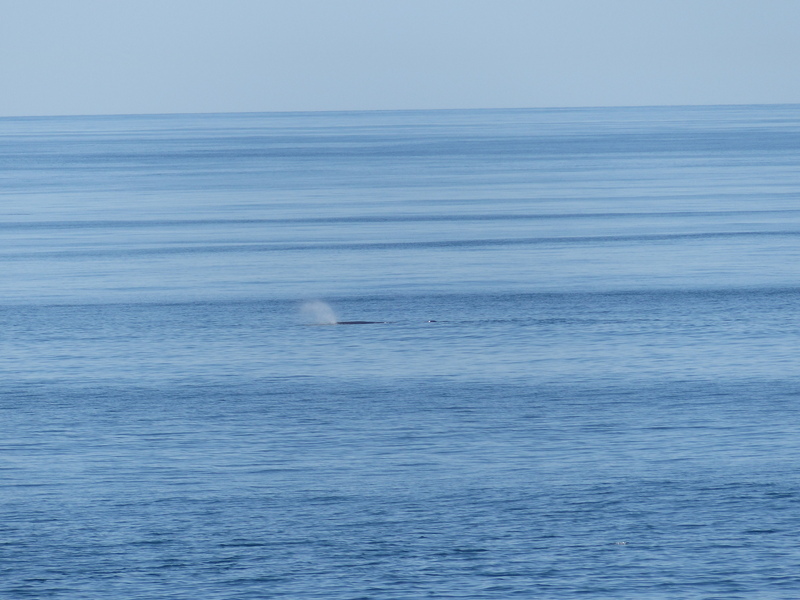 Seas have been calm and temperatures good. I have fallen into a nice routine each day. My shift concludes at midnight; I go to bed till 9:00AM; work out; shower and get ready for next 12 hour shift. I eat lunch and dinner each day and a midnight snack. The days are long but never boring. The crew aboard the Henry B Bigelow is awesome. Internet is sporadic but I was able to face-time with my daughter. Technology is a big part of this whole operation. 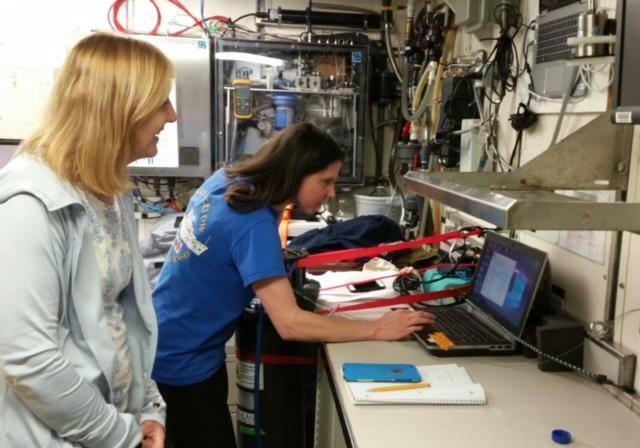 All the programs collecting temperature, salinity and phytoplankton rely on computer programs to run. Second to the chef, the IT person is invaluable. They are trouble shooting problems all day to make sure the collection of data is working. 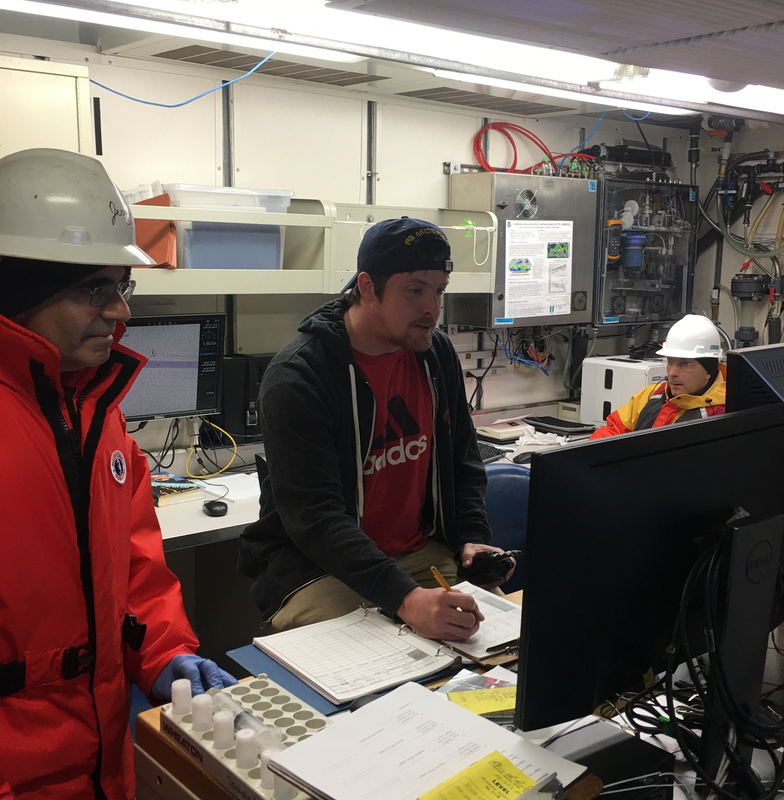 During the longer steams from station to station, I have the opportunity to talk to crew and other scientists. Each person is excited about science. I have never been involved in real science research and I find each day to be fascinating. There is so much time and effort put into collecting the samples. 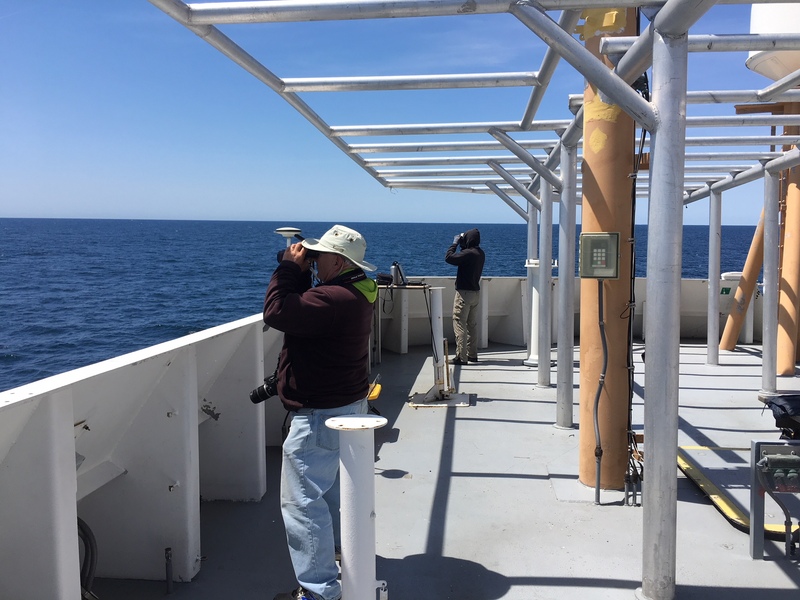 This cruise will collect samples from over 100 stations that will be analyzed and supply much data to give a good picture of the state of our Northeast coastline waters and fisheries. Today was the last day of school for the year for May River High School. Graduation is Tuesday and my thoughts will be with everyone. Congratulations to all my students, especially the seniors. Geographic Area of Cruise: Northeaster Coast of U.S.
At Day 5, I am getting acclimated to life on the sea. Days are filled with data collection at randomly selected stations. One of the collections is of plankton, phytoplankton, zooplankton and ichthyoplankton. 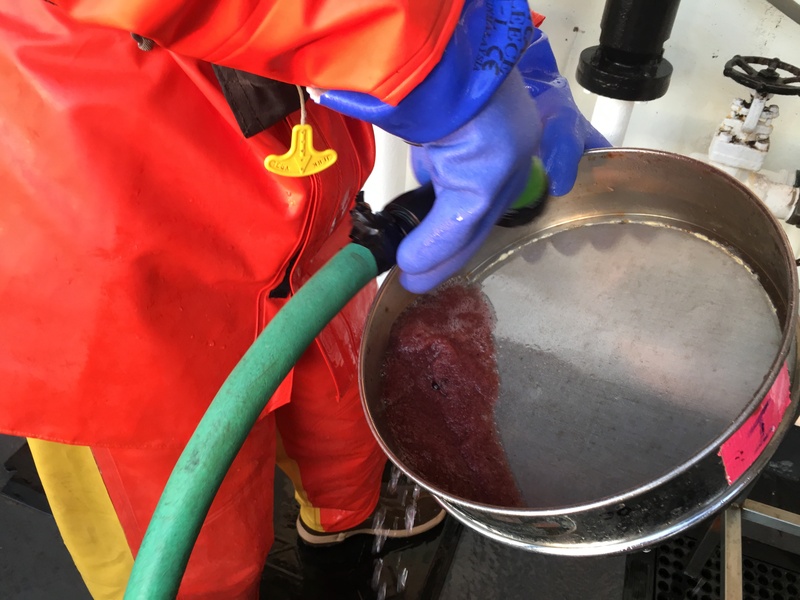 Plankton sampling has occurred since the early 19th century with simple collecting devices. 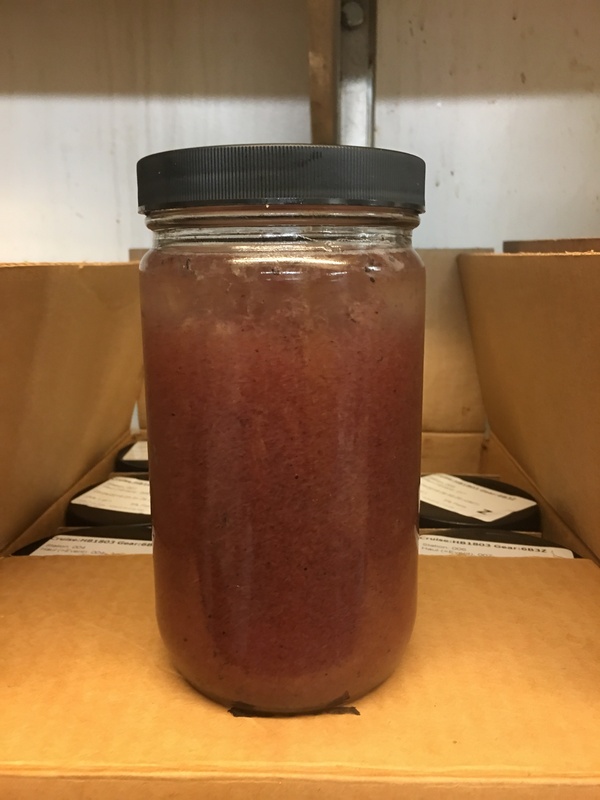 In early ocean sampling, it was believed that plankton were evenly distributed throughout the ocean, so a sample taken anywhere would be a good representation for a large area. This idea is no longer supported. 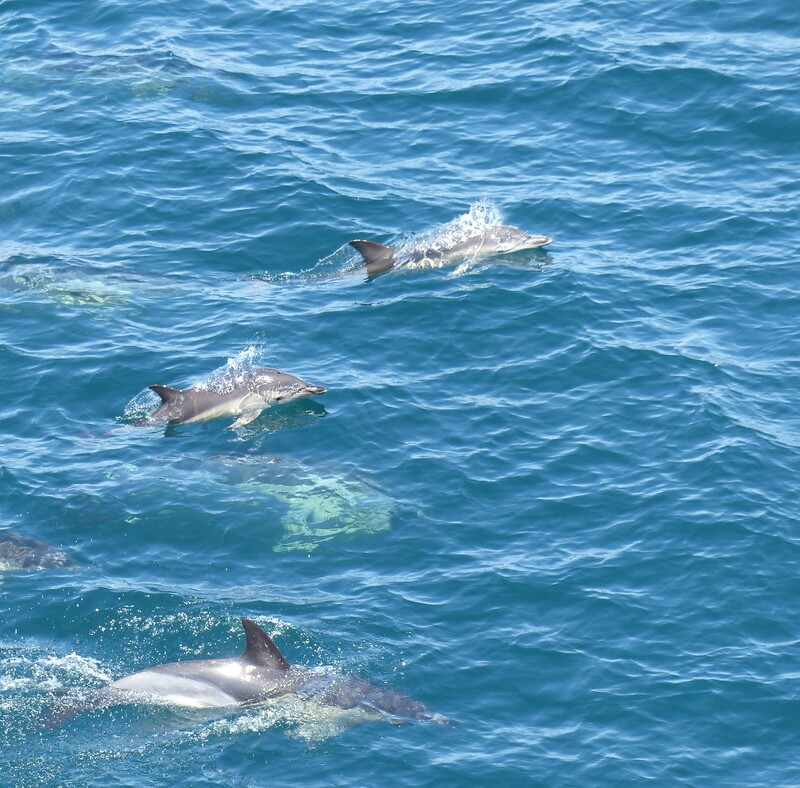 The belief is that there are large scale spatial variations in concentrations of plankton populations, which has lead to random sampling methods using bongo nets. Widely used since the 1970’s, bongo nets are named from their side by side configuration which makes them look like a set of bongo drums. When nets are retrieved, the bongos are rinsed to collect all the samples to the cod-end of the net. 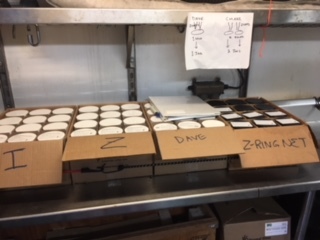 The baby bongo samples are preserved in ethyl alcohol to be sent to the Narraganset Lab to look for fish eggs and larvae and to the University of Connecticut to get a census of marine zooplankton. The large bongo samples are preserved in formaldehyde to be sent to a lab in Poland to identify species and count numbers. After nets are washed they are prepared for next station. 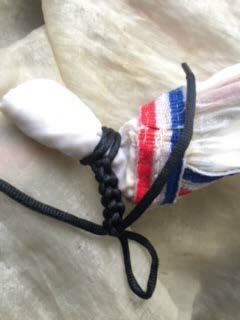 The cod-ends are tied with the “Taylor” knot shown below. After many attempts and a very patient teacher, I finally learned how to tie this knot. What living plankton organisms does the sea contain at a given time? How does this material vary from season to season and year to year? As scientist Chris Taylor reminded me, no sample is a bad sample. 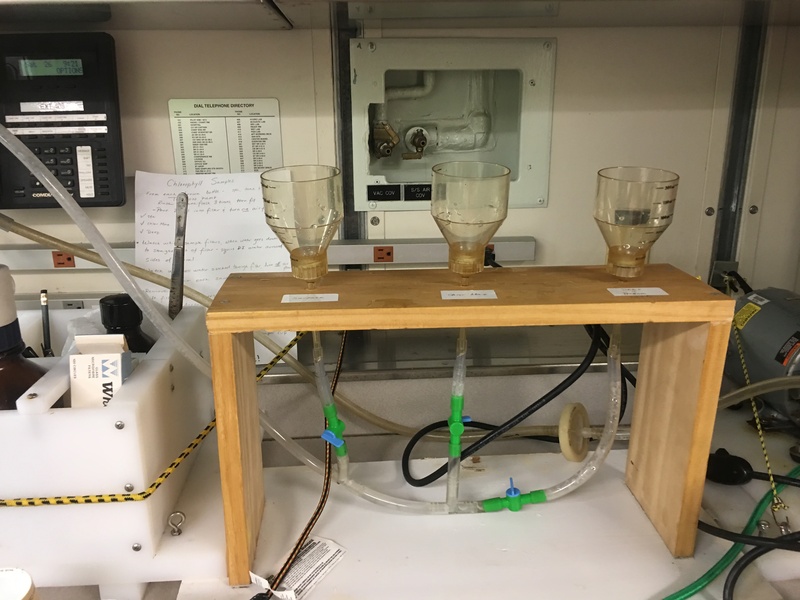 Each sample contributes to the conclusions made in the end. After samples are examined by the labs, I look forward to seeing the results of this survey. I am enjoying every second of this cruise. We did hit rough seas but I had no effect due to wearing the patch. Hopefully, we will have calm seas as we head to the Gulf of Maine. The food is great. Chef Dennis prepares awesome meals. I am eating a lot!! Even had an ice cream bar set up last night. Life is very comfortable on the ship. I choose to interview ship members Andrew Harrison and Maddie Anderson because they are in the process of earning their mariner licenses. Also, the perspective from a female in a male dominated career is of interest. 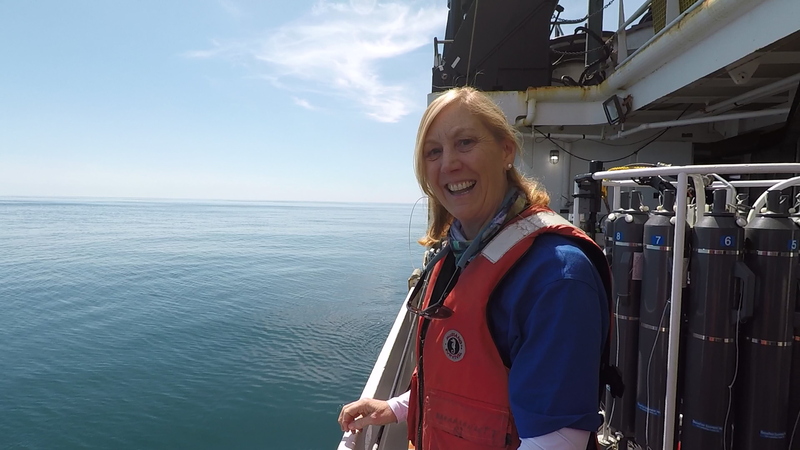 I often get questions from students about opportunities in the marine science field. The marine science field has many paths to take. One path is research and another is earning a Merchant Mariner license. 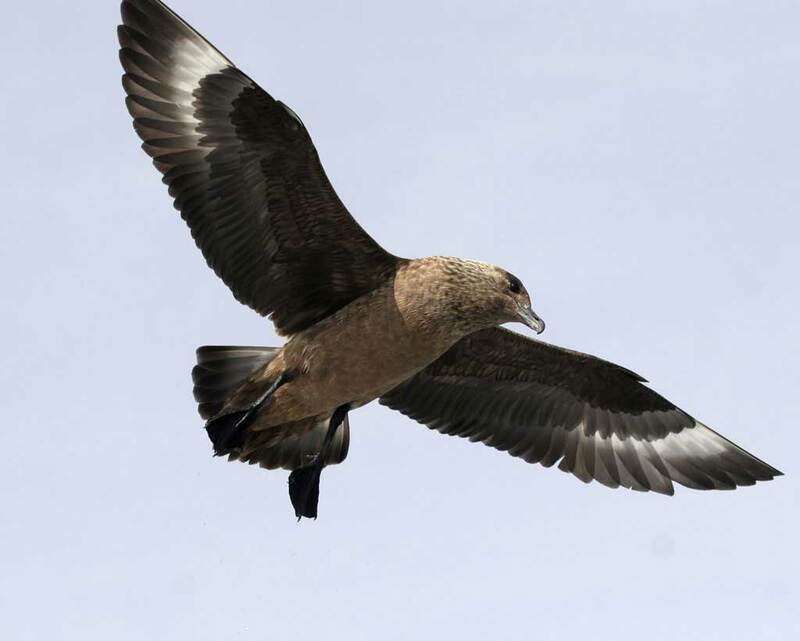 There are several ways to obtain a Merchant Mariners USCG license. The two most common paths are the hawsepiper and Maritime academy. The hawsepiper path begins with accumulating sea hours, taking training courses, completing board assessment and passing the USCG exam. This path can take up to 14 years to complete. In the Maritime college route, requirements for Merchant Mariner license can be complete in 4 years and earn a college diploma. The interviews below give some direction to pursuing a career on a ship. The connecting link between Maddie and Andrew is they both are affiliated with Maine Maritime Academy. Andrew graduated in 2015 and Maddie is presently a student. What interested me the most is that a Maritime degree could be granted through college studies. I had no idea this was an option for students interested in maritime careers. There are 7 Maritime academies across the US. https://www.edumaritime.net/usa/top-maritime-programs, each with their unique specialty. All programs are USCG approved and students earn license upon graduation through the US Coast Guard. From talking to Andrew and Maddie I feel attending college to earn a merchant mariners license prepares one better for life at sea. Andrew: I have a BA Vessel Operations and Technology and a 500 Ton license. Maddie: I will graduate with double major BA in Marine Science / Vessel Operations and Technology. Presently I have a 200 ton license but the plan is to graduate with a 500 Ton and 3rd Mate license. Where did your interest in marine science stem from? 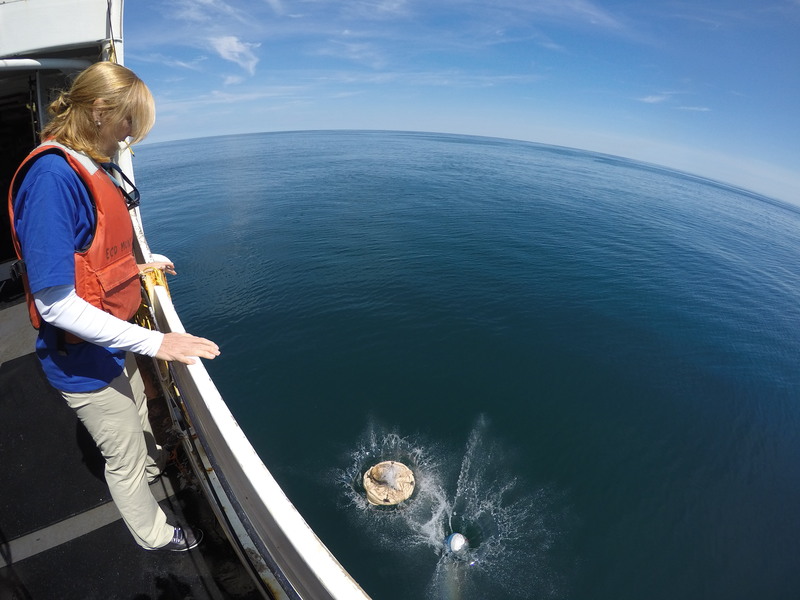 Maddie: Growing up in the middle of Maine, it was difficult to experience the ocean often. My parents would take me to the ocean as a reward or holiday gift. 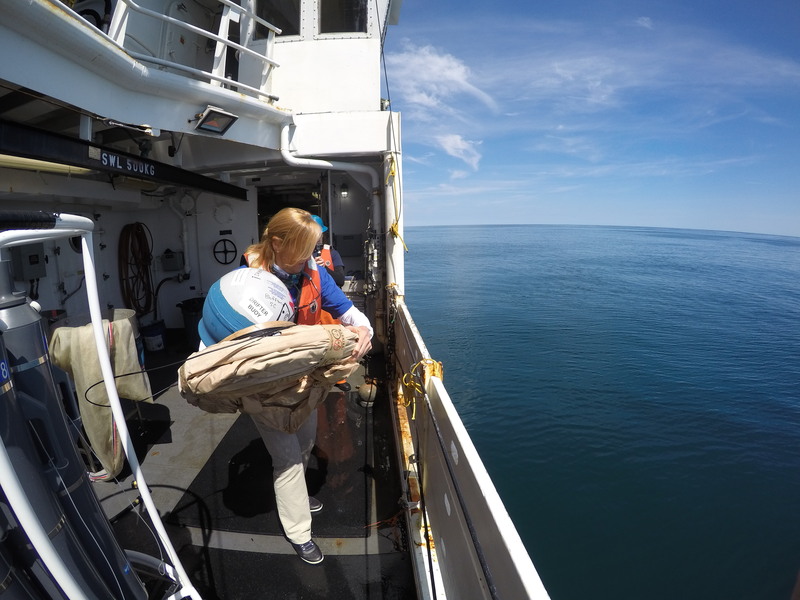 What experiences do students at Maine Maritime Academy get to prepare for maritime license? Maddie: The academy has a ship, The State of Maine, which is a moving classroom. Students practice navigation on the ship. There is also the Pentagoet Tug to practice barge pulling. Smaller vessels are available to practice to practice navigation on. At the academy you can practice on real ships. Andrew: The Academy gives students a faster way to obtain license than a non collegiate Hawsepiper route. Through a maritime college you also earn a college degree and graduate with a license. The academy route is faster but also more expensive. To obtain a similar license without going to an academy would take up to 15 years. Plus the academy has connections to job opportunities after graduation. What other ships have you worked on over the years? Maddie: I have had some experience on a lot of different vessels through the academy. I started working on the Schooner Bowdoin and Brig Niagara for a summer. Then moved on to charter boats and small cruise ships. What advice would you give a student who is interested in pursuing a Merchant Mariners license? Andrew: Volunteer on ships as much as you can. Experience on a Schooner is invaluable. Be prepared to put in the time. Maddie: You have to be self driven and want to be on the water. You also have to be self confident and willing to give it your all at a moments notice. How much time can a merchant mariner expect to spend at sea each year? Andrew: It varies with the vessel and cruise. It can be 9 months at sea and 3 months off; 60 days at sea; and 69 days off; 5-7 weeks on and 3-5 off. The bottom line is to be prepared to be away from home for long periods of time. 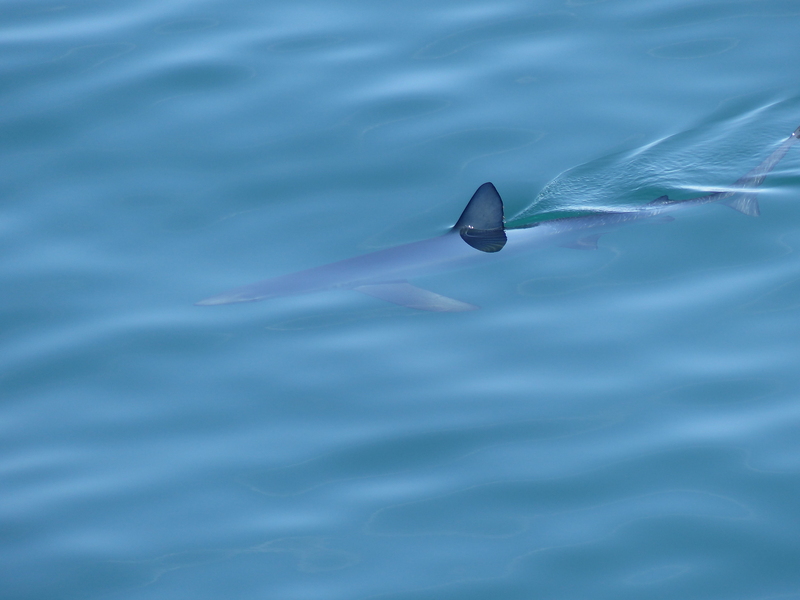 What are your interests and hobbies when you are on shore? Andrew: Fishing, sailing, scuba, reading and video games. Maddie: I like to read, hike and learn to play instruments. Now I am learning to play a didgeridoo- a wind instrument developed by indigenous Australians. 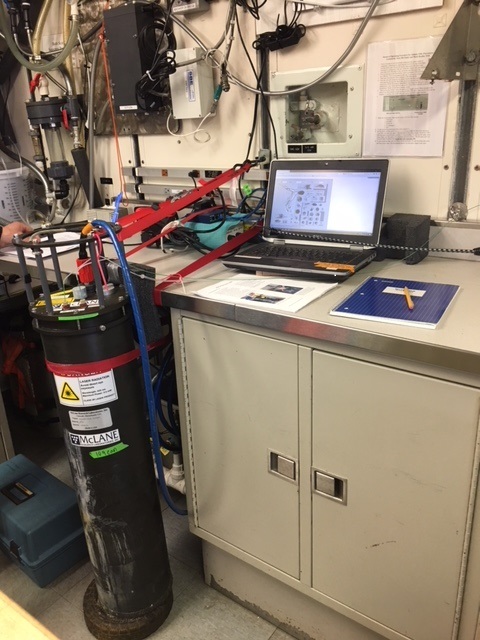 Maddie: Working on a research vessel with ROV exploration. Andrew: In 10 years, I plan to be a 1600 Ton Master Captain working for NOAA or another cruise company. If I was to describe myself in one word it would be a thalassophile- a lover of the sea. 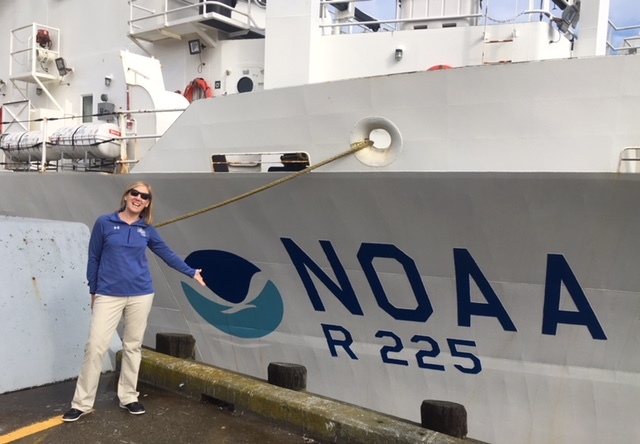 So when I got accepted to the NOAA Teacher at Sea program, I was totally overwhelmed with excitement. What a great adventure! From my younger days boating on Long Island Sound in NY to the present day boating on the waterways around Hilton Head, SC, I have always been drawn to the sea. In college, I studied biology and education and first taught middle school science. Then slowly over the years, my passion for the ocean evolved into teaching Environmental Studies and then to teaching Marine Science. 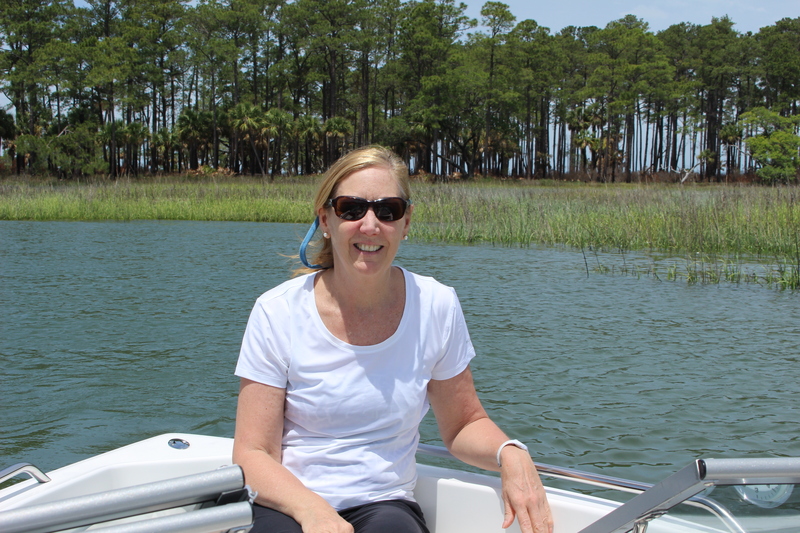 Not being a native southerner, I took many professional development classes to learn about the unique lowcountry local marine ecosystem along the coastline of South Carolina. 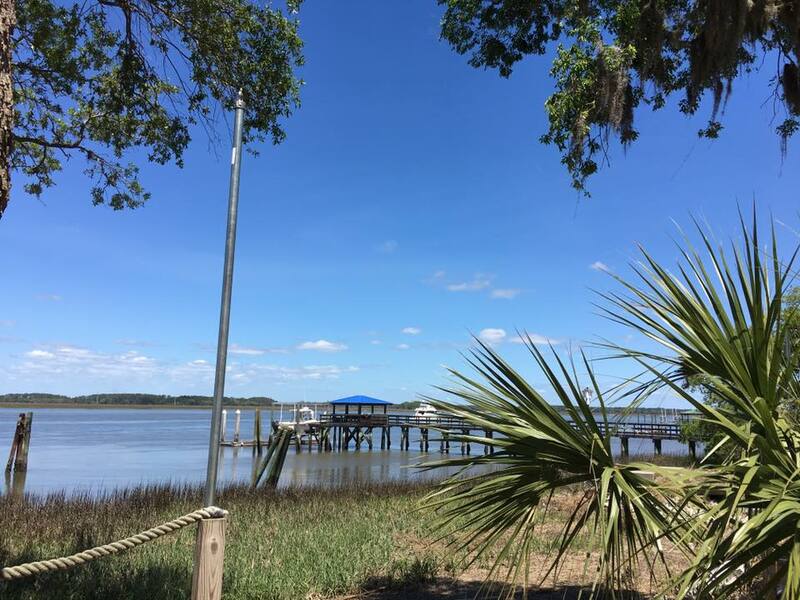 The county I now live in, Beaufort County, is 50% saltwater tidal marsh and borders on the Atlantic Ocean. 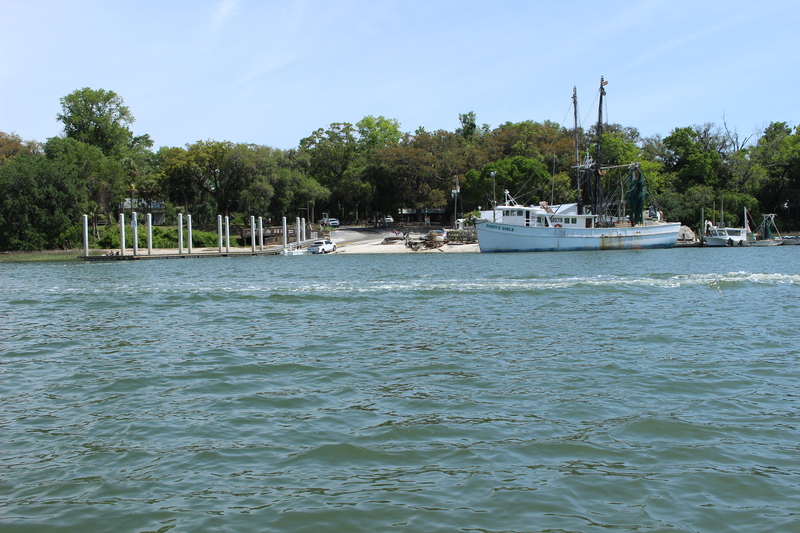 The marine ecosystem plays a large role in the community. I presently teach at May River High School, in Bluffton, SC, and appropriately the mascot is a SHARK! Because we live in a marine environment, teaching students about their sense of place is extremely important. 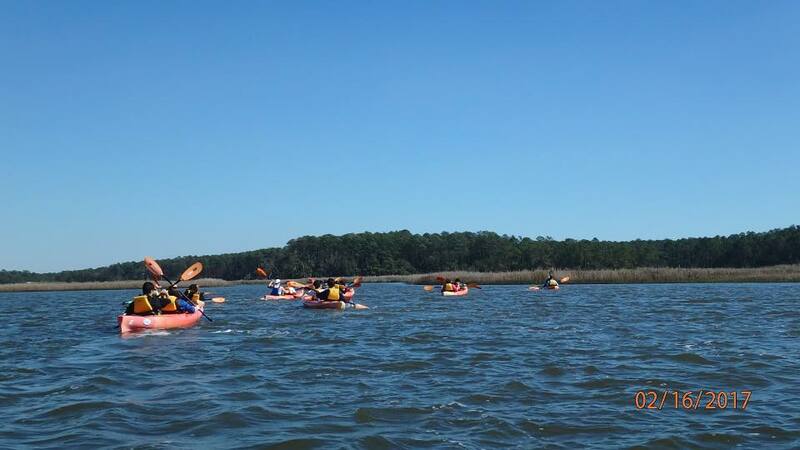 Student take part in numerous field trips directly exploring the local ecosystem – visits to maritime centers, beaches and kayaking on the rivers. In teaching Marine Science, my goal is to instill in my students knowledge of and love and respect for their beautiful home marine environment. 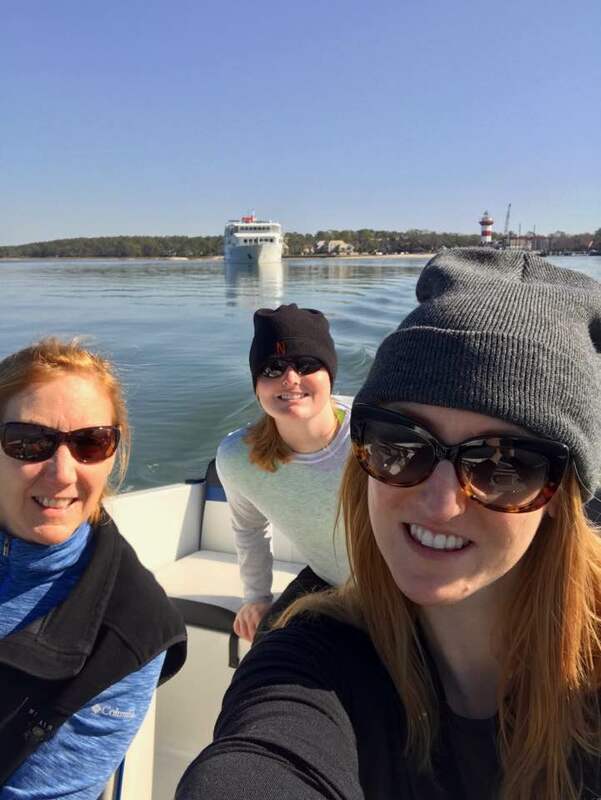 I am a single mother of two adult daughters and their visits include many adventures on the water. 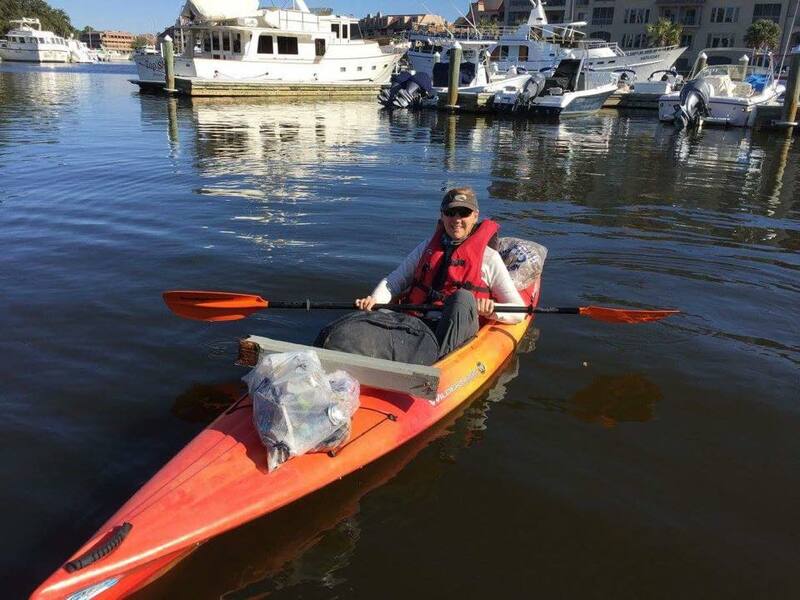 Volunteering in local beach /river cleanups and recycling programs is important to me. After listening to citizens concerns about the local environment, I am so proud to live in a county that recently implemented a plastic bag ban in all grocery stores beginning in October. Being an activist in local environmental causes is important to me. I am so excited to partake on this TAS adventure, to work with real scientists, gathering real data, to bring back to my classroom . 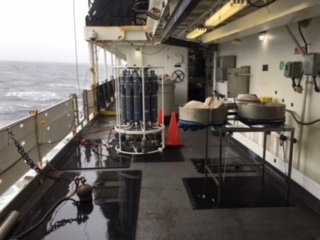 Aboard the Henry B. Bigelow, a NOAA state of the art research vessel, I will work along scientists collecting data on the hydrographic, planktonic and pelagic components of the northeast Atlantic. In two weeks, my journey into the Northern Atlantic Ocean will begin! Leaving 9 days before the end of school, my students will end of year test and graduate without me present. But we will be connected as they follow my experience at sea through the wonders of technology!